Tabloids recently reported that Shirley Yeung (楊思琦) was seeking reconciliation with ex-boyfriend of 8 years, Gregory Lee (李泳豪). Shirley allegedly texted him two messages, “I love you” and “I miss you” during his birthday in May this year. Instead of mending their relationship, Shirley’s text messages reportedly left Gregory even more determined to make a clean break with her. Gregory reportedly even decisively threw away Shirley’s belongings, to cut all ties with her. Tabloids also claimed that Shirley pretended to have a breakup with her daughter’s biological father, ex-Olympic diver, Andy Ng (吳帥), in order to seek public sympathy to revive her career. This led to speculations that Shirley was once involved in a love triangle with Gregory and Andy. Shirley Fakes Breakup With Andy Ng? Last year, Shirley Yeung’s reputation hit rock bottom after she heartlessly dumped ex-boyfriend, Gregory Lee for another man, and then later become an unmarried mother. Shirley reportedly had quarrelled with Andy over his debt problems, but had since reconciled after she gave birth to her daughter. 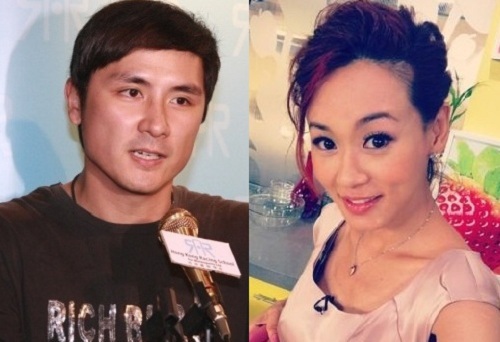 Under the instructions of a top executive at TVB, Shirley allegedly faked her breakup with Andy to shed her promiscuous image, while gaining public sympathy. Shirley Uses the Same Trick Twice on Gregory? After breaking up with Gregory in June 2011, Shirley allegedly sent text messages messages of “I still love you very much; still miss you very much” to Gregory. The insider disclosed that Shirley did this last year, in order to pave Gregory as her “backup” in case her relationship with Andy failed. On Gregory’s birthday in May this year, Shirley reportedly sent two similiar text two messages, “I love you” and “I miss you.” The insider revealed that Shirley thought that Gregory was an easy man to manipulate. “I don’t know what this woman is thinking! At that time, Gregory was willing to put behind Shirley’s cheating, and begged her for reconciliation, but Shirley stood firm. She even said things like do not stop her frrom getting rich! Gregory had painfully put down the relationship, but now she still does all these things! She thought that Gregory was easy to manipulate! Gregory’s family and friends were so worried; everyone advised him to be sober and not to be soft-hearted,” said the insider. Lee Ka Ding to Gregory: Do Not Respond to Her! Perhaps Gregory was “bitten” once last year, he may be more determined to make a clean break with Shirley after receiving her love messages. Gregory allegedly told his friends that he did not harbor any thoughts of reconciliation. He would not respond to her text messages either. Gregory allegedly was so adamant to cut off ties with Shirley that he allegedly donated bags of her belongings to The Salvation Army, without even keeping a single thing as a memento! However, Shirley did not directly respond when she was asked if her breakup with Andy was a “smokescreen.” She only said that her objective was to work hard and raise her baby; her love life will be pushed aside for now. tht poor shirley… she wll forever be haunted by ths..
er, faking a breakup with that andy guy will not help her shed her “promiscuous image”, as we already know she did it with him (probably while she was still with gregory) and ended up with a daughter. if anything, it would be better if she had married the dude. gregory will be the laughing stock of the hk entertainment industry if he ever took her back. I find it unbelieving how some people are having a go at Shirley and her “promiscuous image”. There are heaps of gold diggers out there in the HK entertainment industry who are more than happy to become a mistress to a millionaire. Millionaires who have wives !! Some of the celebrities that get away with dating married men are off limits but Shirley gets attacked for having a baby. If this is true, she’s a manipulative biatch. I don’t think she’s faking her breakup with Andy, mainly because it seems like she doesn’t want to break her mom’s heart again. She is disgusting *pukes* she is worse than Viann in the manipulative department. *thumps up* for Gregory for cutting all ties! I agree and she is worse than Viann. Great that Gregory put his foot down and cut all ties with her. I cannot believe that Shirley is that manipulative. I do not think that she faked the break up with Andy though. But then again, I can be wrong. I bet it is 620. Maybe you are right that she is faking it to gain sympathy. If so, she is more despicable than I originally thought. Glad that Gregory has realized that and cut all ties with her before he falls into her web of manipulation and lies. Funny that when it comes to stars like Deric, you are like, we don’t know if it’s true, yet when it comes to Shirley, you condemn her 100% without giving her the benefit of the doubt. I would not say that I condemn her 100% which is why I am not sure if she truly broke up with Andy or not just to gain sympathy from the public. I have some doubts as well… The accusations in Deric’s case were way over the top with the knife and all which is why it is harder to believe then the accusations in this case. Plus we all have proof that she lied about her pregnancy. I hope the news is not true. It will not reflect well on Shirley if she did that. Even if she feels sorry for what she did to Gregory and regrets breaking up with him, she had a baby with another man. She should accept the consequences of her actions gracefully unless he makes the first move to forgive her and get back together with her, then she has a choice whether to reconcile with him. The tone of the article makes her sound like she is desperate and trying to win him back even though she was the one whom rejected him previously and had a baby with another man. It does not make her look good if she pursues him to reconcile and try to get him to accept her baby with another man. I think even if Greg really want to get back with her, he won’t because of his family. He seems to be someone who obey his family a lot. He won’t go against his family. fully agree, she is so bad and I hope she don’t get pity for anyone as she is a devil, to treat someone who cared for her for so many years and want to do it again to him. Gregory’s father has the right of it. Refuse and beware, but be cordial. He’s not a bad looking guy, he will be fine. shirley denied love messages… so how cn u all say she manipulating gregory.. maybe all she did was text gregory in a friendly manner.. wanting to let bygones be bygones.. just gregorys dad misunderstand..
and thts why she said hi to gregorys dad too.. thy hve known each othr for a long time. maybe aftr being a mum she has matured n knows tht she was wrong in the past n nw looking to patch friendship nt love mind u.. so why r we saying thts manipulative..
Shirely, be a strong woman and mother. Never go back to your past. There is no point to do it. Don’t let other people humiliate you. She never come out and be honest about the situation. There was a lot of he said she said…when someone doesnt seem sincere they probably arent she needs to come clean so these messy rumors can disappear…Shirley focus on raising your daugther right, make sure she doesnt do what you did. She is a goldigger. Thought she found a rich man but it was a lemon. Biatch thinking she could now live her life as a Gigi Lai or Cathy Tsui got a nasty surprise. She had to crawl her way back to TVB begging 620, doing these low grade hosting jobs. I bet when she’s hosting she’s thinking “oh f*** why am i working with these kelefares? Get me f****** out of here”. Any female that enters the entertainment industry or want to enter are gold diggers. They all want to get famous and then they can marry a rich man. I don’t even know why rich men are like this. Why not marry a woman that is not in the entertainment industry. Lol I didn’t know that Shirley is with the cameos and that she’s hosting shows. Why she really went back to square one then. This is exactly what happened to my bf’s older bro’s ex. They dated for nine years and that grl has been sleeping with another man and got a daughter with an old man. That man already has a daughter that is 20 years old already. She married for the money. A very similar story to shrilly except that shrilly probably got played by Andy and got her pregnant. This shows how a girls character is when she got pregnant and the dude left.